When most folks think of Liverpool, England, The Beatles immediately come to mind. For music geeks, that city has given birth to dozens upon dozens of other great bands. One of the most fertile time periods in Liverpool history, apart from the early ‘60s, was the late ‘70s and early ‘80s. It’s nearly impossible to list them all in this intro, but bands like Echo & The Bunnymen, The Teardrop Explodes, Yachts, The Lotus Eaters, China Crisis, Wah!, Frankie Goes To Hollywood, Deaf School and A Flock Of Seagulls were all born and bred in this city, the fourth largest in the UK. One of the most successful bands to emerge from the ‘pool during this time was Orchestral Manoeuvres In The Dark, more commonly referred to as OMD. 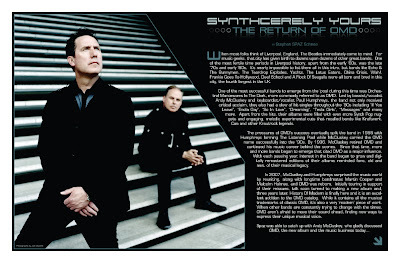 Led by bassist/vocalist Andy McCluskey and keyboardist/vocalist Paul Humphreys, the band not only received critical acclaim, they also had a slew of hit singles throughout the ‘80s including “If You Leave”, “Enola Gay”, “So In Love”, “Dreaming”, “Tesla Girls”, “Messages” and many more. Apart from the hits, their albums were filled with even more Synth Pop nuggets and engaging, melodic experimental cuts that recalled bands like Kraftwerk, Can and other Krautrock legends. The pressures of OMD’s success eventually split the band in 1988 with Humphreys forming The Listening Pool while McCluskey carried the OMD name successfully into the ‘90s. By 1996, McCluskey retired OMD and continued his music career behind the scenes. 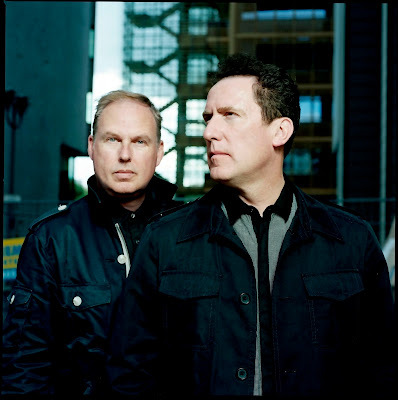 Since that time, more and more bands began to emerge that cited OMD as a major influence. With each passing year, interest in the band began to grow and digitally remastered editions of their albums reminded fans, old and new, of their musical legacy. 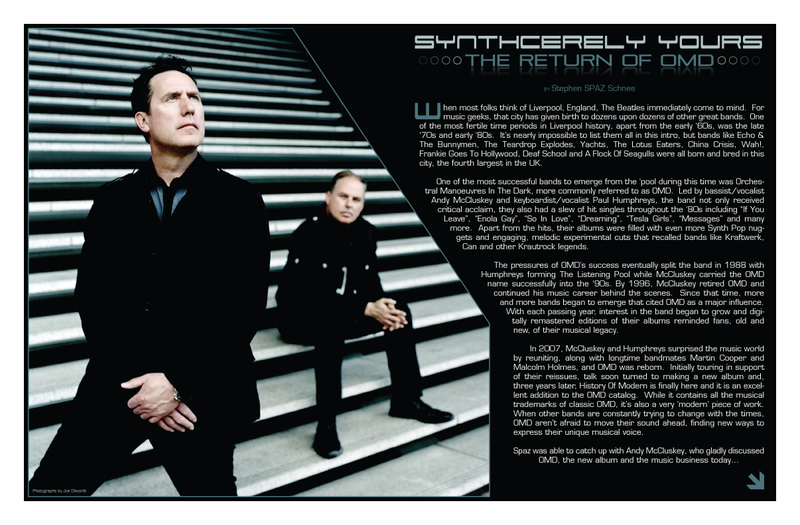 In 2007, McCluskey and Humphreys surprised the music world by reuniting, along with longtime bandmates Martin Cooper and Malcolm Holmes, and OMD was reborn. Initially touring in support of their reissues, talk soon turned to making a new album and, three years later, History Of Modern is finally here and it is an excellent addition to the OMD catalog. While it contains all the musical trademarks of classic OMD, it’s also a very ‘modern’ piece of work. When other bands are constantly trying to change with the times, OMD aren’t afraid to move their sound ahead, finding new ways to express their unique musical voice. SPAZ: You reunited and officially kicked things off with a tour in 2007. What’s taken so long in putting the new album together? ANDY MCCLUSKEY: Making a great album takes time. We wanted to be absolutely sure that we had strong ideas and really good songs. There would be no point coming back with a terrible album! SPAZ: A lot has been said about this being the first OMD album in 14 years, but more importantly, it’s the first studio album featuring the classic line up in 24 years. What was it like to actually have everyone recording together again for the first time in over two decades? AM: Even in the old days, we seldom had all four of us in the studio together. It’s just not the way we did things. We usually played, one person at a time, building up the song in stages. These days with songs written in computers, the writing process is also the recording process. However, Paul and myself found that trying to bridge the geographical distance (he lives in London and I live in Liverpool) by using the modern technology of sending files by the internet was too slow and had no chemistry. We finished the album by working together in my studio. That was very creative. We sparked ideas off each other just like the old days! AM: It’s all Pro-Tools now… And we generally use soft synth versions of the old ones that we used to have…plus some great new ones. We can make a better sounding record in our programming rooms than we could in expensive studios in the past. SPAZ: Did you record the new album with any prior album (or albums) in mind, in terms of revisiting any stylistic or musical themes, or were you aiming to strike out in a new direction? 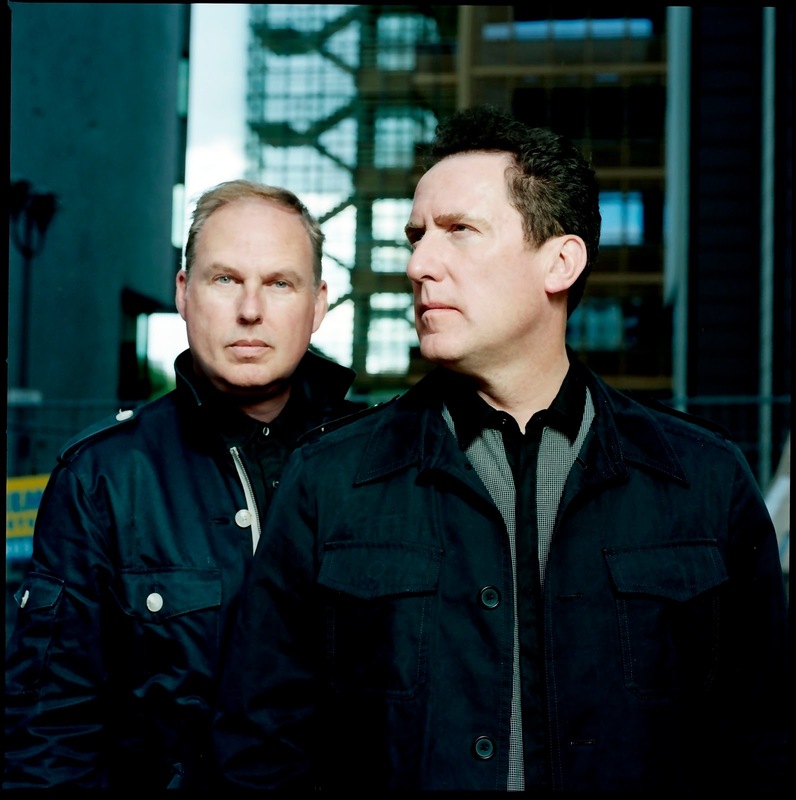 AM: We looked back at our musical output and decided that the first four albums were really the truly distinctive voice of OMD. So we endeavored to use the sound palette that was our own unique style whilst making sure that the production was 2010 and we were not doing a nostalgic pastiche of ourselves. SPAZ: The album retains all the hallmarks of classic OMD, from pure pop to experimental, yet is still fresh. Did you allow outside forces to dictate the direction of the album or did you work off of pure instinct and inspiration? AM: Our best work has always been when we followed our own instincts. When we made records doing things that we believed in without fear of commercial failure or critical reviews, we always made our best records. This is what we tried to do on History Of Modern . Obviously, we were aware of what has been going on in music over the years and I am sure that we have subconsciously adopted new ideas as well. SPAZ: With such a great selection of songs, how did you go about choosing “If You Want It” as the first single? AM: Singles have always been difficult for us. Yes, there are several candidates on this album. “If You Want It” was chosen because the radio stations in Germany and UK said they would play it. That does not mean that we think it’s the best song…just that it works as something on the radio to advertise the new album. We know that we will never have hit singles again. SPAZ: Your less commercial and more experimental tracks (such as “The Right Side” and “New Holy Ground”) tend to be fan favorites even more so than the singles. When you are recording, what ultimately convinces you that a particular track is ‘going on the album’? AM: We simply just have to believe that it works. Musically, emotionally or lyrically. As long as we have time to be a little objective we can usually determine what is good or bad. We do like a balance on an album. We like to try some strange and interesting stuff. But it has to be musical as well as adventurous. SPAZ: “New Babies, New Toys” sheds light on your feelings about the modern music scene. Are there any current bands that you feel are worthwhile? And what are your feelings about auto-tune? SPAZ: The track “Save Me” features an original vocal track from a classic Aretha Franklin recording. What gave you the idea to go back and rebuild a new musical bed around her vocals? AM: We had done an almost complete album of mash-ups but there was no way that we could get clearance at a level that wouldn’t mean it actually costing us money. Strangely, the Aretha vocals actually got cleared and we thought that it was such a great combination of a wonderful vocal from 1967, our song ‘Messages” from 1980 and yet the finished production sounds so 2010. The track was just going to be a bonus track but the U.S. label loved it so much they put it on the album. SPAZ: Did you have many tracks left over from the History Of Modern sessions that will eventually be released? OMD are known for their excellent b-sides and such…. AM: We have a couple of great melodies and backing tracks that we didn’t finish. We always loved doing b-sides because we really had even more freedom than on the albums or singles. We still love doing our ‘bonus tracks’ as they are now. SPAZ: What’s next for OMD? SPAZ: What is currently spinning in your CD players? AM: Robyn’s Body Talk Part 1 and Body Talk Part 2... Kraftwerk’s Trans Europe Express. MIKE PAULSEN: Where are the remaining remasters (Junk Culture, Crush, and Pacific Age)? We're dying here! AM: Thanks for asking, Mike. It was important for us to get the early albums remastered because they sounded terrible and we believe them to be our best. There is good stuff on the later ones but they are not as consistently good or as interesting. However, we are aware that these three albums are probably the best known in the USA. They will no doubt get remastered. We would just like to concentrate on the new album first. MP: On Dazzle Ships, the experimental title track indicates Parts II III & VII. Were there actually ever Parts I, IV, V, VI, etc. or was it all a ruse? AM: The track is a collage of several ideas that were then sequentially cross faded into each other. There certainly were other ideas that didn’t get used, though they were never actually numbered. The idea of calling it Parts II, III and VII was to reflect that it was just some of the ideas that were used. Special Thanks to John McCormack, Meghan Schmitt, Braden Merrick, Scott Schumaker and Mike Paulsen.